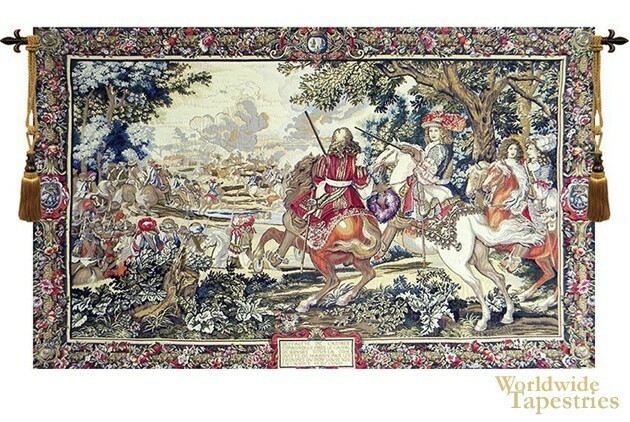 This "Le Roi Soleil" tapestry shows a work originally woven by the Royal Gobelins Manufactory at around 1670. The occasion for this tapestry was the defeat of the Spanish army by the French, which occurred in the Bruges Canal in 1667. The Royal Gobelins Manufactory was a major powerhouse of tapestry production in France from the 17th century and produced beautiful works which celebrated nature as well as the subject matter itself. Here we see the royal party on horseback and his army celebrating, including some ladies in the procession. Le Roi Soleil refers to King Louis XIV, who was known as the sun king, who loved the arts. The details of the verdure features such as the foliage of the trees enhance the beauty of the work, as we see the party in all its fine attire, including the attire of the horses. A very detailed and ornate border completes the work. This fine art tapestry "Le Roi Soleil" is backed with a lining and has a tunnel for easy hanging. Note: tapestry rod and tassels, where pictured, are purchased separately. Dimensions: W 42" x H 26"
Dimensions: W 58" x H 39"